Under the United Nations convention on the law of the sea (1982), each participating country maintains exclusive economic and environmental rights within the oceanic region extending 200 nm from its coastline, known as the Exclusive Economic Zone (EEZ). Although the ocean within each EEZ has a vast capacity to absorb anthropogenic CO2 and therefore potentially be used as a carbon sink, it is not mentioned within the Kyoto Protocol most likely due to inadequate quantitative estimates. Here, I use two methods to estimate the anthropogenic CO2 storage and uptake for a typically large EEZ (Australia). Depending on whether the Antarctic territory is included I find that during the 1990s between 30–40% of Australia's fossil-fuel CO2 emissions were absorbed by its own EEZ. This example highlights the potential significance of the EEZ carbon sink for national carbon accounts. However, this 'natural anthropogenic CO2 sink' could be used as a disincentive for certain nations to reduce their anthropogenic CO2 emissions, which would ultimately dampen global efforts to reduce atmospheric CO2 concentrations. Since the oceanic anthropogenic CO2 sink has limited ability to be controlled by human activities, current and future international climate change policies should have an explicit 'EEZ' clause excluding its use within national carbon accounts. Atmospheric CO2 concentrations would be about 55 ppm (parts per million) higher than their present concentration without the oceanic anthropogenic CO2 sink. The ocean has hindered the extent of accelerated climate change and will continue to absorb about 33% of fossil-fuel emissions well into the future . The ocean CO2 sink is different to other carbon sinks in that it directly remediates against climate change by sequestering anthropogenic CO2 on both short and long timescales. The exclusive economic zone (EEZ) is an oceanic zone legally bound to nation states under international law . With the global EEZ representing 27% of the oceans area, the question arises as to how significant could the EEZ CO2 sink be for national carbon accounts. I use Australia as a case study to estimate the EEZ anthropogenic CO2 sink due largely to the detailed accounting information on CO2 emissions from fossil fuels and land-use changes  along with its very large oceanic territory. In fact excluding the Antarctic territorial claim, Australia's EEZ is one of the largest in the world and covers an area 8.2 × 106 km2 , which makes it larger than its continental land area (7.7 × 106 km2). I have calculated the accumulation (storage) of anthropogenic CO2 within Australia's EEZ (including the Antarctic territory) for the 1990–1999 period to be 2.12 ± 0.7 Pg CO2 (Pg = 1 × 1015 g) with an annual increase of about 220 Mt CO2/yr (Figure 1). The calculations are described in the methods section a the end of the manuscript. 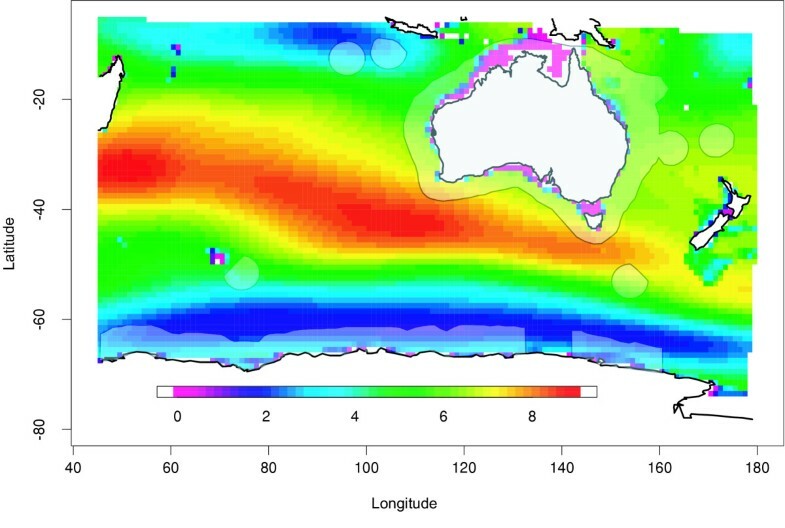 This storage of anthropogenic CO2 within Australia's EEZ does not necessarily imply the flux occurred within the EEZ as the ocean can redistribute CO2 from its uptake region to other locations. If I assume that Australia's EEZ absorbs anthropogenic CO2 at a rate equivalent to the global oceanic mean flux (7.3 ± 01.5 Pg CO2/yr [1, 5]), I can obtain an independent flux estimate. As Australia's EEZ accounts for 2.4% of the total surface ocean (3.61 × 108 km2), the mean anthropogenic CO2 flux for Australia's ocean is about 175 MtCO2/yr throughout the 1990s. This calculation assumes Australia's EEZ acts in proportion to the global average oceanic anthropogenic CO2 flux. Even though the ocean is relatively homogenous, most studies suggest the Southern Ocean to be the region of highest uptake . Since Australia's EEZ contains both Southern Ocean waters and sub-topical waters, it is likely that large variations occur within the Australian EEZ. Despite this however, my estimated range for anthropogenic CO2 uptake within the Australian EEZ (175–220 MtCO2/yr) is in agreement with a recent modelling study  that estimates a range between 160 to 340 MtCO2/yr depending on the areal extent of the Australian EEZ. The estimated storage of anthropogenic CO2 (mol/m2) between 1990 and 1999 within the South Indian/Pacific Ocean. The approximate location of Australia's EEZ is shown in the shaded regions and includes Australia's continental EEZ, Norfolk and Lord Howe Islands in the Tasman Sea, Cocos and Christmas Islands in the sub-tropical Indian Ocean, the sub-Antarctic Islands (Macquarie and Heard) and the Australian Antarctic Territory. The total inventory of anthropogenic CO2 within the EEZ is 2.1 ± 0.7 PgCO2. Australia's EEZ anthropogenic CO2 uptake is significant when comparing to Australia's CO2 emissions via fossil-fuel usage or land-use (Figure 2). Based on my analysis, Australia's oceanic EEZ CO2 sink over the 1990s (1750–1980 MtCO2) is about 3 times the magnitude of the CO2 source due to land-use changes (655 MtCO2) and about 30–40% of the total magnitude of fossil-fuel emissions (4695 MtCO2). The implications of including Australia's EEZ or any other nations EEZ within the framework of global carbon trading would be considerable. Furthermore direct human influence of the EEZ CO2 sink through carbon runoff from land use/irrigation/agricultural practices may also significantly influence national carbon accounts for nations with large EEZs. Anthropogenic CO2 budget for Australia during the 1990s. Fossil fuel CO2 emissions (shown by the solid black line) and land-use based emissions (shown by the solid green line) were taken from the Australian Greenhouse Office's National Carbon Accounting System. 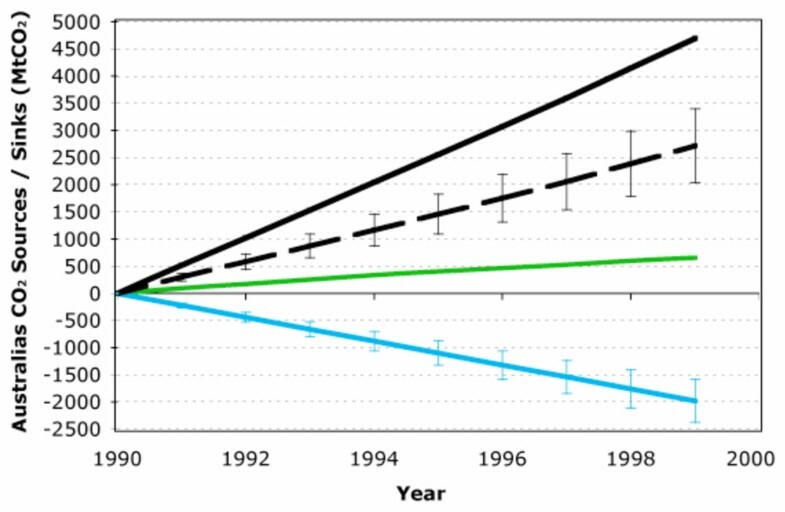 The estimated EEZ CO2 sink from this study is shown by the solid blue line with an associated uncertainty of approximately 20%. The sum of all these sources and sinks represent Australia's net CO2 emissions (shown by the dashed black line). Nations with large EEZs (like the USA) aren't necessarily those who will benefit the most from including the EEZ carbon sink in international climate policy, as it depends on the relative amount of EEZ sink in comparison to a nations annual anthropogenic emissions. Despite the USA claiming the worlds largest oceanic territory (~10 × 106 km2), its EEZ anthropogenic CO2 sink only absorbs less than 3% of its annual fossil-fuel emissions. On the other hand small island nations (such as in the South Pacific) have the most to gain due to their low very anthropogenic CO2 emissions relative to their large potential EEZ CO2 sink. Tonga, Fiji, Samoa, Soloman Islands for example have vast oceanic territories that absorb many times over their annual fossil-fuel CO2emissions. Although Australia emits near the highest amount of anthropogenic CO2 per capita in the world, its relatively low population and vast oceanic territory results in the EEZ carbon sink being highly influential to its national carbon accounting. However, this 'natural anthropogenic CO2 sink' could be used as a disincentive for certain nations to reduce their anthropogenic CO2 emissions, which would ultimately dampen global efforts to reduce atmospheric CO2 concentrations. Along with the fact that the oceanic anthropogenic CO2 sink has little ability to be controlled by human activities, it should be explicitly excluded within current or future climate change policies. The international legality of the EEZ carbon sink and its potential implications requires careful consideration in formulating an equitable future framework for climate policy that aims at reducing atmospheric CO2 levels. The global EEZ represents over a quarter of the surface area of the ocean, which undoubtedly acts as important reservoir for sequestering anthropogenic CO2. Just as nation states have varying degrees of land coverage they also have varying degrees of EEZ extents. To demonstrate the potential implications of the EEZ anthropogenic CO2 sink, I have roughly estimated the uptake for Australias EEZ which is one of the largest in the world. By comparing the amount of anthropogenic CO2 sequestered by Australias EEZ to Australias CO2 emissions via fossil-fuel/land-use, I show that including the EEZ has significant implications for Australias national carbon accounts and any other nation who maintains a large EEZ. As the EEZ carbon sink may introduce legal grounds for nation states to possibly exploit, which would ultimately dampen efforts to reduce atmospheric CO2 concentrations, current and future international climate change policies should have an explicit 'EEZ' clause excluding its use within national carbon accounts. Due to the lack of temporal CO2 measurements within Australia's EEZ, to quantify the EEZ anthropogenic CO2 sink I use a recently developed method that exploits a purely transient tracer . The method uses oceanic measurements of chlorofluorocarbons (CFC) coupled with atmospheric CFC observations  to determine water mass ages . These water mass ages are then used with knowledge of the CO2 atmospheric history , alkalinity and carbonate chemistry equations  to estimate an accumulation of anthropogenic CO2 from 1990 to 1999. Although the method is indirect, the total uncertainty has been quantified to be between 10–20% by comparing results from direct temporal CO2 estimates  and within a general ocean circulation model . B.I.M was supported through a grant from the Australian Research Council.